Set to evolve into a comprehensive ‘electric mobility ecosystem’ of products, services, technologies and innovations, ranging from electric vehicles to fast charging systems, wall box charging points and home energy storage units, EQ will be the brand name under which all of these products and services will be bundled. In this, the intention is to create a consistent and clear image under the EQ banner for sustainable products and services bearing the Mercedes-Benz star. As such, EQ will exist as a stand alone, independently operated division within the Daimler organisation alongside, though separate from, Mercedes-Benz, Mercedes AMG and the Maybach division, each one having the mandate to develop its own individual and distinctive ‘brand persona’. The first EQ model revealed to the public, which arrives in Ireland in Autumn 2019, carries the model designation EQC. 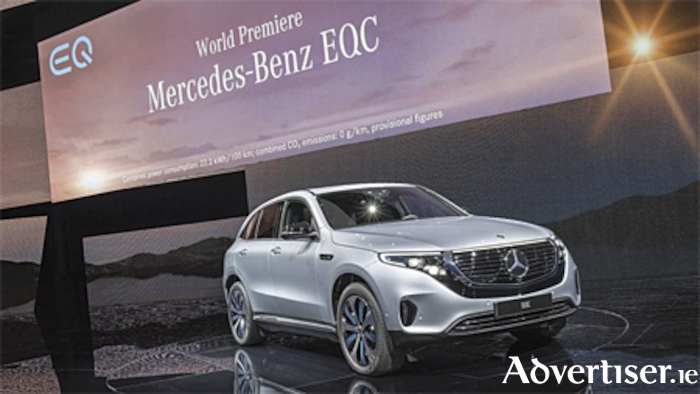 A sporty, five-seat SUV coupé based on the GLC, EQC made its original appearance in public at the Paris Motor Show as a ‘close-to-production’ concept vehicle. Visually, there will be no mistaking it as a member of the Daimler family. Branded with the familiar ‘star’ motif, designers have given the EQC a distinctive ‘electro look’ reflected in its silver finish, sweeping grille and dynamic silhouette marked by a flowing transition from front to rear. Inside, various innovative solutions combine to create a completely new concept summarised in the word ‘case’, an acronym for ‘connected’, ‘autonomous’, ‘shared’ and ‘electric’, a fusion of the four pillars upon which EQ concept is built. Standard fitments include MBUX and ‘Hey Mercedes’ driver assist and command features. Its powerful electric drive system is driven by two electric motors mounted front and rear, whose system output can be increased thanks to scalable battery components. Standard battery power is 80kWh. Power output is 402hp/765nm delivering an acceleration figure of 0-100km/h in 5.1 seconds. A permanent all-wheel drive system delivers the guarantee of dynamic high-level performance with a range up to 500 kilometres. A fast charge system can bring power level up from 10 to 80 percent in just 40-minutes. Customers switching on the electric motoring can expect a second EQA model introduction scheduled for 2020 followed by a further eight new models by 2022. In Ireland, EQC and subsequent EQ models will be distributed through a dealer organisation the composition of which will be announced closer to launch.